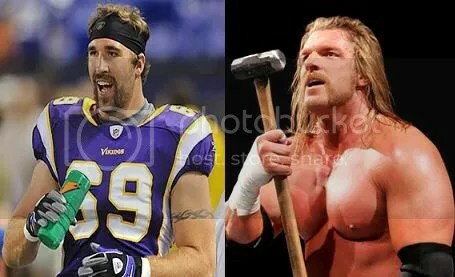 The 5-0 Vikings may be extremely good at football (we’ll see just how good Sunday), but that doesn’t mean they don’t feature a full cast of goofy-looking characters on their roster. Let’s dive in, shall we? These next two take up more space on the defensive line than Haloti Ngata and Kelly Gregg could even aspire to. 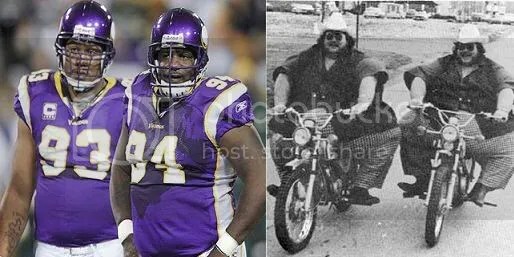 However, as huge as they look next to other NFL players, they look even more impressive during their every day lives. He once threw 12 interceptions in a game – just to see what it would feel like. He plays like a kid out there – but has no idea how many he actually has. He has retired more than anybody in the history of retiring. This next image should be giving the Ravens’ defense nightmares the next few nights. Usually these Lookalikes! are meant to be insulting to the other team…but if our purple and black don’t figure out how to tackle, and quick, this could be one of the most prescient Lookalikes! we’ve ever put up. Vikings starting Tight End Visanthe Shiancoe is a Morgan State Alum. More like “ORGAN State,” amirite?!?! More “experts” than I expected are picking the Ravens on Sunday. I’ll have to keep that in mind as I put together tomorrow’s game preview, but right now, I just don’t see it. This entry was posted on October 15, 2009 at 12:18 pm and is filed under Humor, lookalikes, Ravens. You can follow any responses to this entry through the RSS 2.0 feed. You can leave a response, or trackback from your own site. 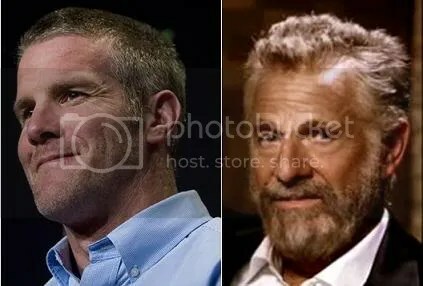 Haha the Favre one is great! Is that a self portrait for the Shiancoe look a like? Yes, i did submit my portrait for the Shiancoe picture. Thanks for noticing.